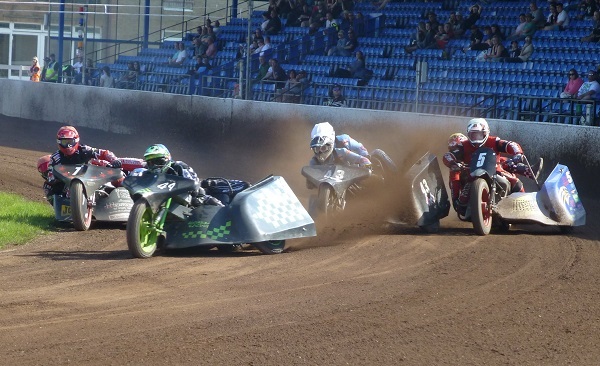 Fantastic racing, with two rounds of the British sidecar Speedway Championships. It was Friday tea time and time to head off to the B.M.F. 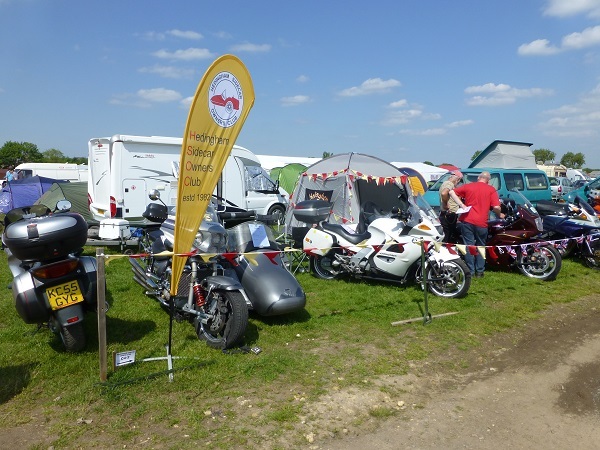 Show at the East of England showground with blue skies and the sun this made for a pleasant trip although only a short one with twenty miles being covered. 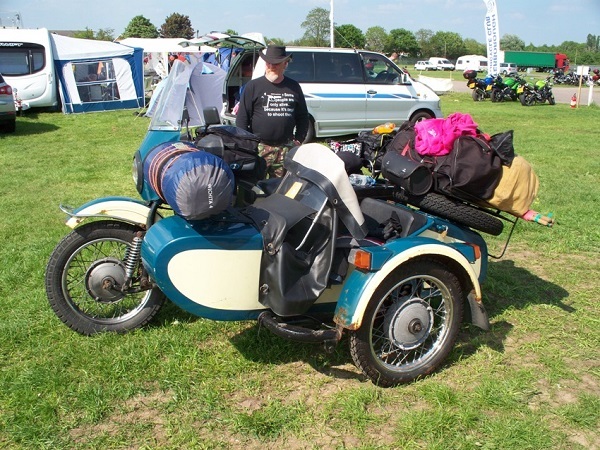 On arrival at the Tri Anglia Wheels stand I was a bit concerned as it was full to bursting with outfits from the club members and I thought to myself “where is the outfit going?”. 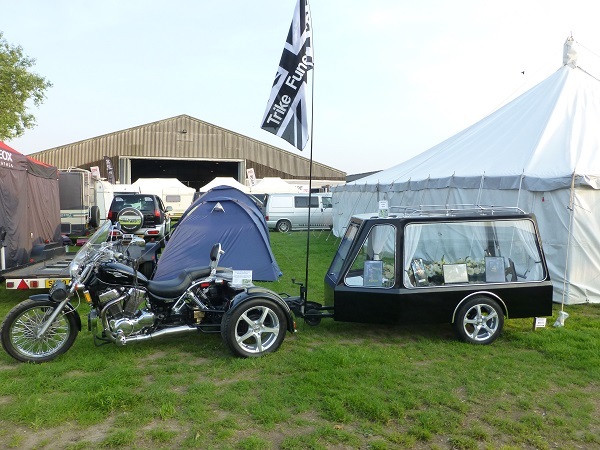 Then I saw the camping area and was a wee tad concerned as where was the tent going but room was made for both with some outfits being pushed back in the display part of the stand. Friday evening was spent socialising and having a few beers and some of us going to halls to listen to the bands which were playing. Saturday saw the gates open to the public and with the good weather it seemed that there were a good number coming through the gates as it seemed to get a bit busy. The show itself has got a lot smaller over the years and this year seemed even smaller; it was £18.50 to get into the show on the day and I think I would have been disappointed as a day visitor. 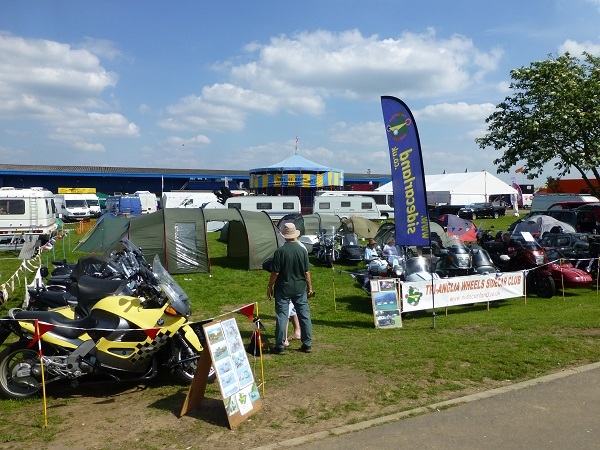 There were the usual trade stands and bargain tents but in reduced numbers and the auto jumble was almost invisible. Most of the displays seemed to be by owners clubs and some of these were a bit poorer than previous years. 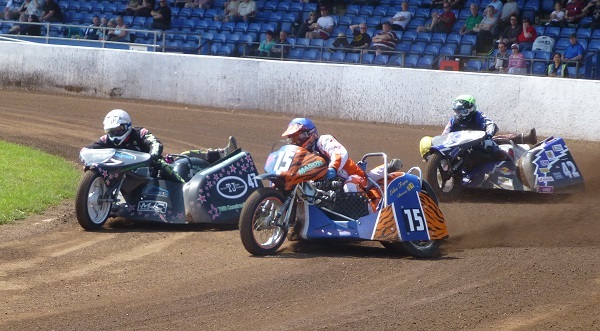 There was plenty going on in the main arena with the Moped Mayhem and the 1000cc sidecar racing, the only disappointing thing was we couldn’t get the Scooter Boy into the Moped Mayhem. 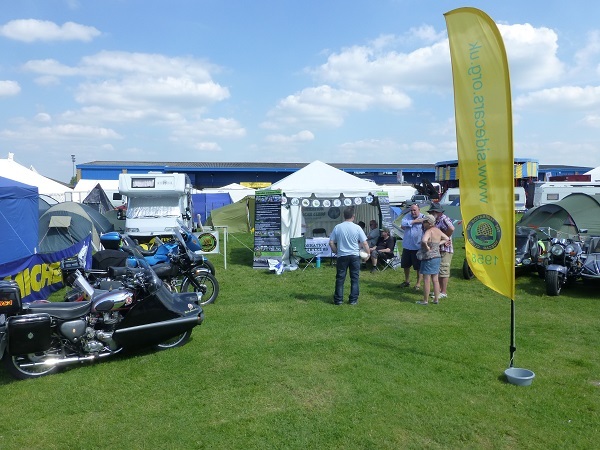 The Fed stand moved this year and was next to the Wheels team and we seemed to get a lot of interest over the weekend on both stands. A chap showed some interest in Ray’s BMW and I think he got all the information he needed as he was there for about an hour although I did see Ray poke him with his stick and say “are you listening young man”. I think there was an eating competition on Saturday between Ray and Richard as when one of them fancied a bit of food the other one had the same, no wonder the pasty van was always out of pasties when I visited it and as for Ann’s cakes the lids were off and they were gone. 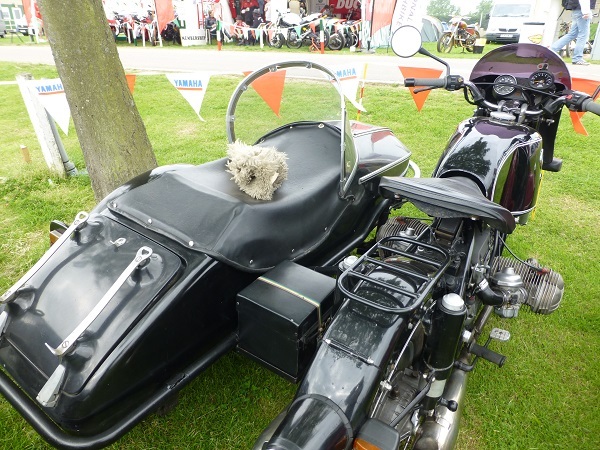 Peter & Helen’s Triumph outfit attracted a lot of attention as well as the Flying Banana and Steve’s Harley and a lot of people were looking at Doug’s Martello sidecar. 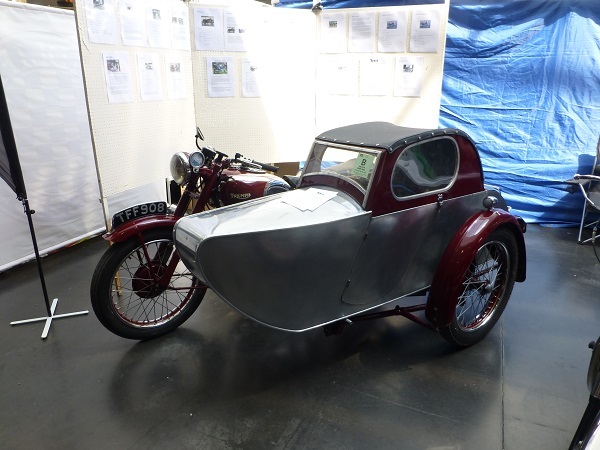 The numbers visiting on Sunday seemed low and this gave me the chance to spot a balloon on my sidecar with L plates printed on it and I had my thoughts on who had placed this there but was shocked to find out it was Roy, yes, she dobbed you in Roy, didn’t you Lesley. I always like to visit the Wall of Death and this year’s display was superb with the young lady carrying out most of the display, myself and Ray were most impressed. Dave and Peter took part in the cavalcade of clubs for us. The show may have been a bit small this year but with the good weather and the usual light-hearted banter this made for a good weekend. Thanks to Martyn and Lesley for booking the stand and bringing the stand display stuff. See you all soon. What wonderful weather we had on this weekend! 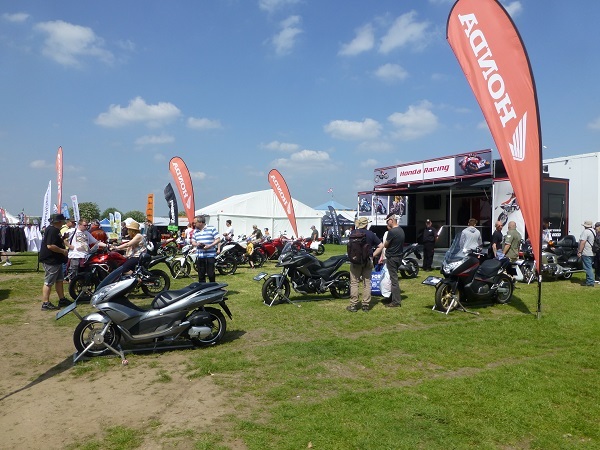 It was the warmest BMF Show that I had attended for a few years. I had a nice ride to Peterborough early on Saturday morning, a hot air balloon was rising as I approached Grantham – nice to see some else enjoying the weather too. 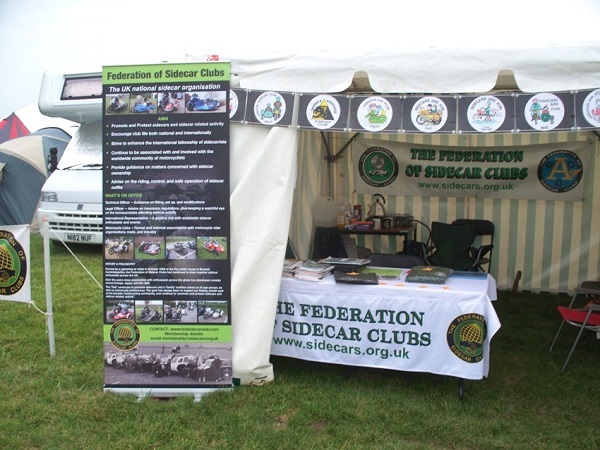 Arriving at the showground I quickly found the Fed stand; this year it was situated next door to the Tri-Anglia Wheels Club stand. Usually Lesley points me on the way to our stand, but this time I was told “you are here”. The new stand position – close to the manufacturers’ stands – gave us a larger number of people walking past than had our previous position in the club stands’ area. 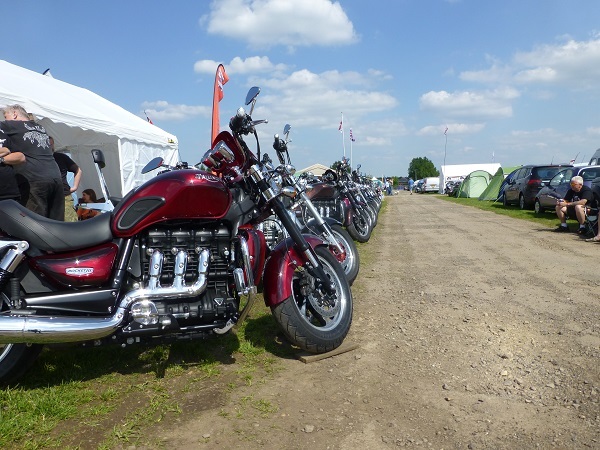 There were lots of manufacturers displaying bikes; Indian Motorcycles were alongside Victory. 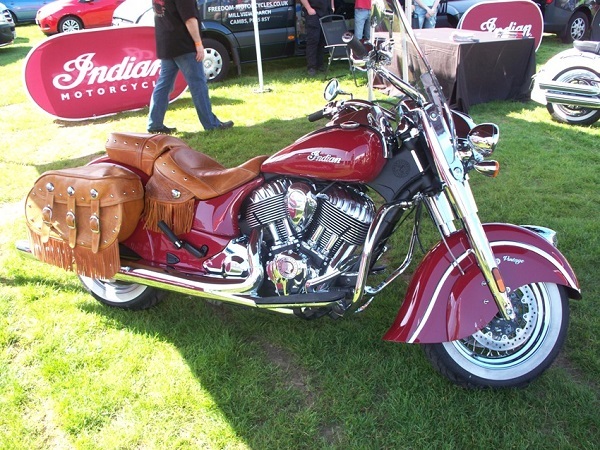 These new Indian machines come with a 5-year promotional warranty. 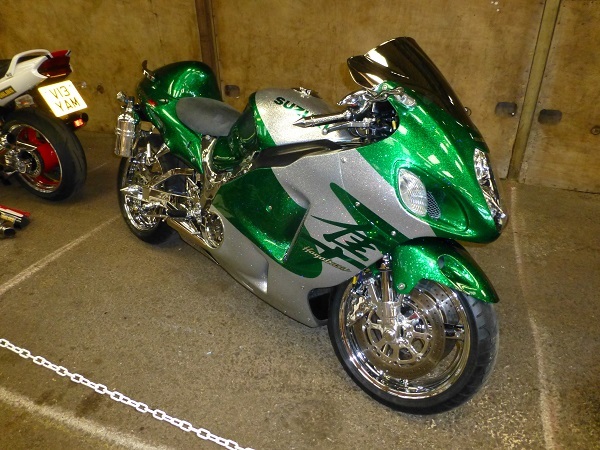 The bikes looked good and they are apparently selling quite well. 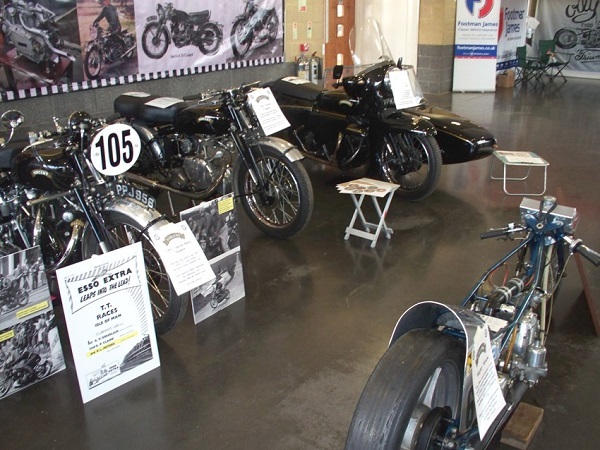 Interestingly the other stand next door was Harley-Davison, so there were three cruiser-style manufacturers together. Harley had a bike set up in a frame, with the wheels of the bike resting on rollers, so anyone could ride the bike without it moving! 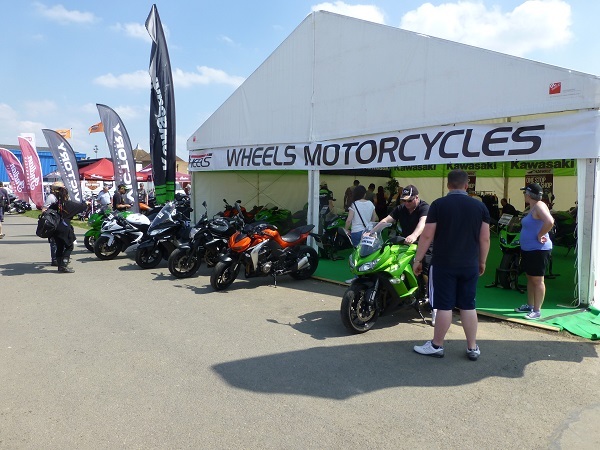 There were nice displays from other makers, including Ducati, Honda, Kawasaki and KTM, who also had stands close by. 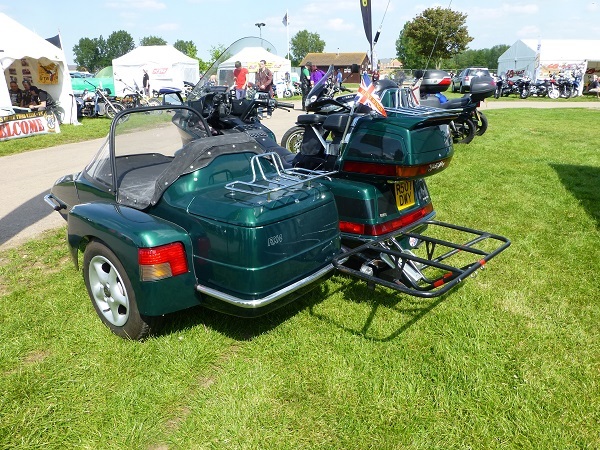 Some dealers had demo bikes available for you to try. 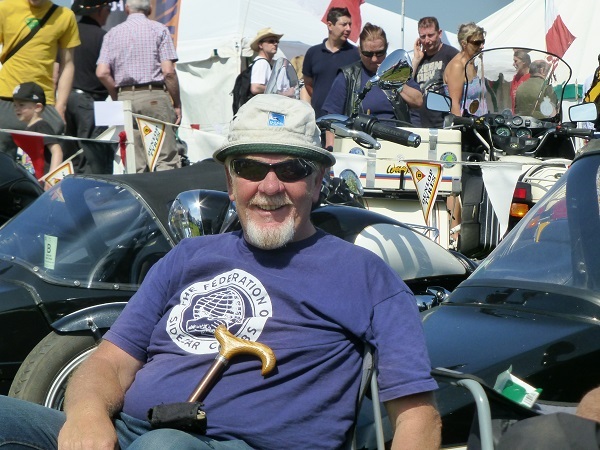 Talking to Dave Johnson, of the Vincent Club, the Classic / Vintage Hall was busier this year than last. 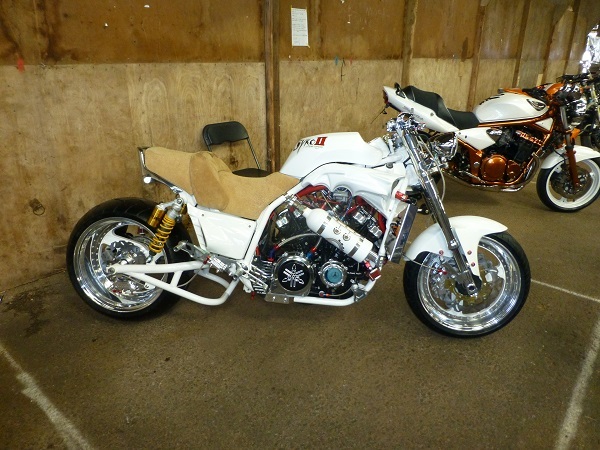 The Vincent Club had a nice display of machines to look at, including “Mighty Mouse” – a 500 cc single cylinder drag racer. At one time this machine had held the World Record for its class. 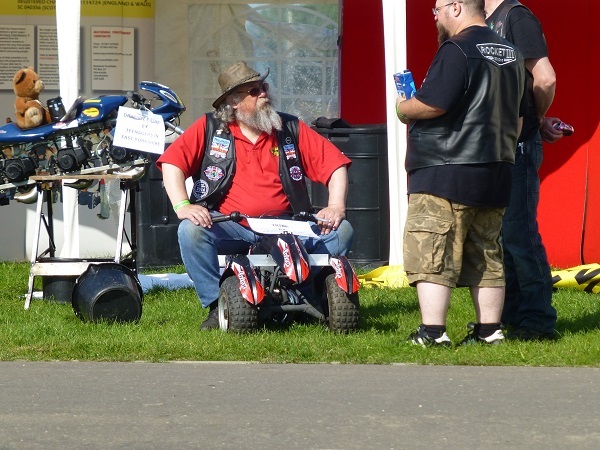 Its rider fired it up outside the hall and it was so noisy that the club members helping wore ear protectors! Wandering around the Club Village Area there were some good stands to look at. 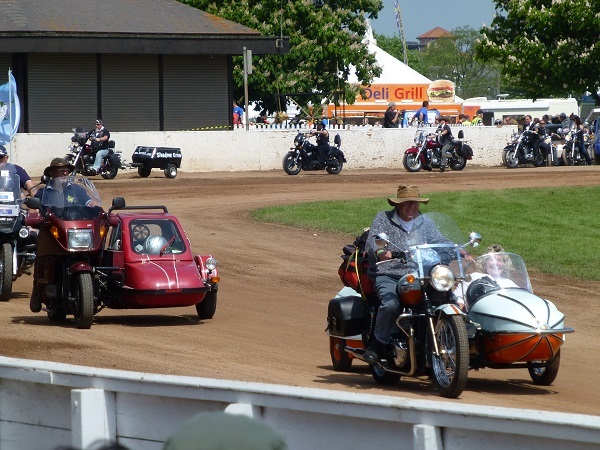 The Hedingham Club and the London Sidecar Club had displays here. It was nice to meet up again with Tracey Priestly who was helping out on the Jumbo Run stand. As usual, there were lots of bargains to be had. On one stand I spotted £129 jackets reduced to £40; and even better – Frank Thomas jackets were selling for £20 and crash helmets from £20 upwards. There was lots of gear to look at and plenty of people were carrying away bags stuffed with goodies. 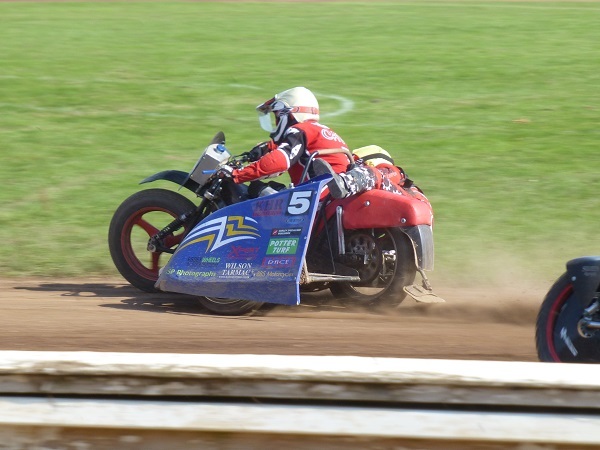 The Main Arena was as busy as ever, with stunt riders giving displays, speedway sidecars racing, motoball was being played plus the Moped Mania, which took place on Saturday and Sunday. 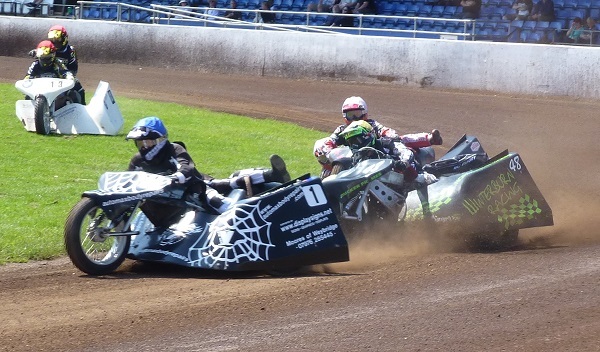 A friend of mine who rides motorcycles had never seen sidecars racing before, and he was amazed at the way they went, and also at the antics of the passengers (“mobile ballast” as somebody called them!). At a show like this food and drink are important, and luckily there were plenty of outlets to choose from. The Fed stand had two new pop up banners; these were very good. 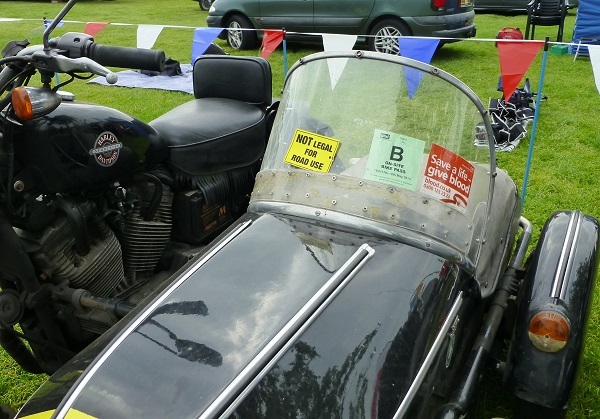 At the bottom of the banner was an older photo of members and their outfits – we had lots of comments like “my dad or granddad had a sidecar like that”. 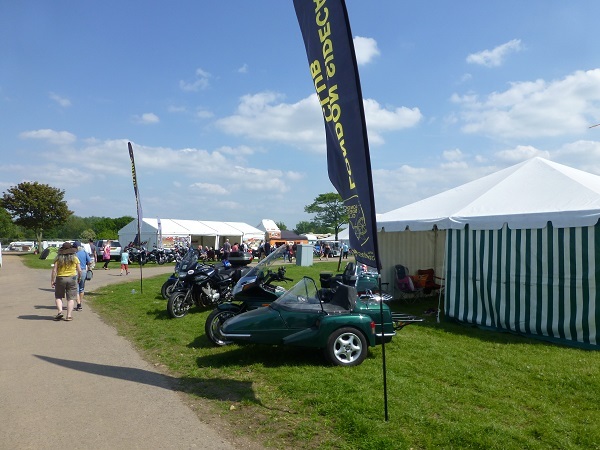 We had a lot of interest in sidecars again this year, as did the Tri-Anglia Wheels stand next door, and we both gave out lots of flyers. 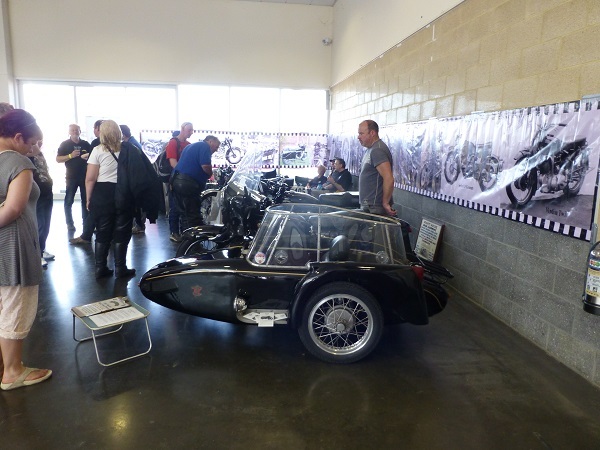 Dave and Shirley’s BSA outfit proved a draw, as did the Vincent outfit, and a BMW outfit attracted the attention of the BMF people who took photos of it; it may well appear in their magazine. Two new members signed up to the Fed over the weekend. For those camping and making a weekend of it there was entertainment on the Friday and Saturday evenings. 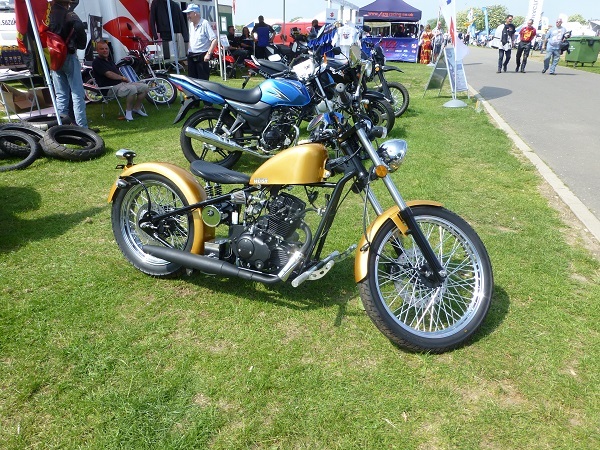 A really great show, with plenty to look at; the Indian motorcycles looked good as did the WK machines nearby. The weather helped to make things go with a swing. 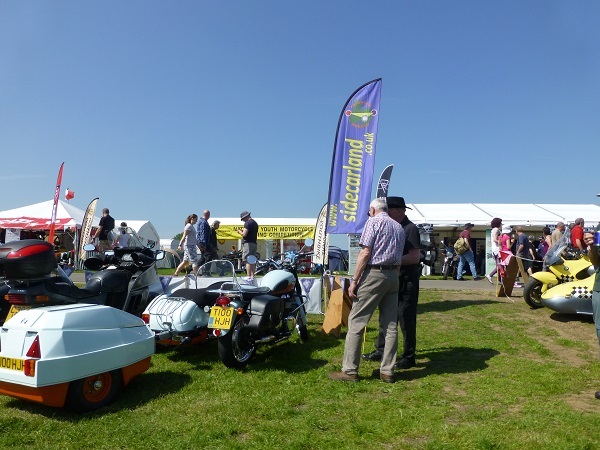 However, the show was not as busy as it had been a few years ago, and it will be interesting to see how many people attended overall. It is a good show and well worth a visit, especially if you are looking for some new gear or fancy a ride on a demo bike.